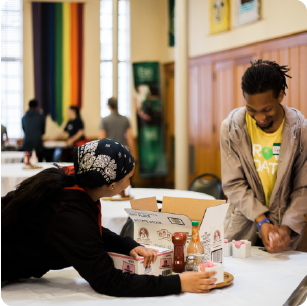 We serve breakfast to the hungry... with dignity! 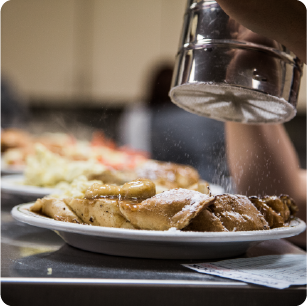 The Crescent City Cafe currently hosts a free, volunteer led, restaurant-style breakfast twice a month for homeless and low-income guests. We also plan to open a pay-what-you-can community cafe in the near future! Since serving our first breakfast in 2009 we have provided our guests delicious meals in a dignified and respectful manner. 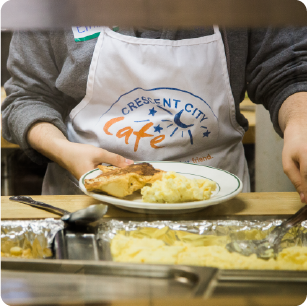 We desire to 1) serve all cafe guests a delicious meal with dignity, 2) unite all individuals around a common purpose to serve the community through shared meals, and 3) create community while recognizing food insecurity does not define a person or their worth. We are opening a pay-what-you-can community cafe! As the need for food security continues to grow in New Orleans, so does the vision of the Crescent City Cafe. We plan to expand our efforts by creating a full-service cafe, operating our own restaurant space, and serving breakfast and brunch daily. 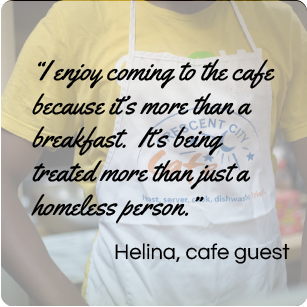 Anyone that visits the cafe will be able to enjoy a meal regardless of his or her ability to pay. The Crescent City Cafe will join over 60 pay-what-you-can community cafes in the United States — including the Jon Bon Jovi Soul Kitchen in New Jersey, the S.A.M.E. Cafe in Denver, and F.A.R.M. Cafe in North Carolina. 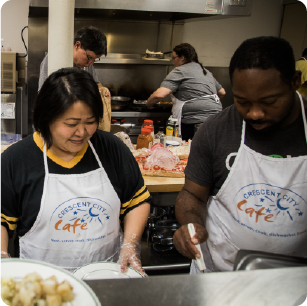 Our inclusive dining model will help the Crescent City Cafe build a diverse, interconnected community where low-income guests will dine and volunteer side-by-side with paying customers. Our expansion will create the opportunity for guests to build relationships and connect with one another through the sharing of a meal. 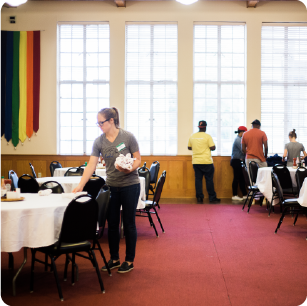 We are excited to expand and serve more people with dignified dining. Contact us to learn more! 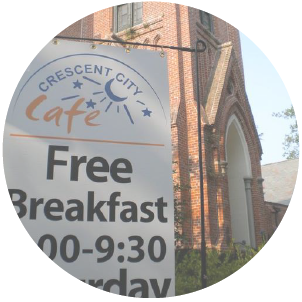 The Crescent City Cafe at Rayne is our current volunteer led free breakfast for the homeless and low-income people of New Orleans. Since 2009 we have provided a dignified dining experience for our guests and volunteers, simulating the look and feel of a restaurant while also encouraging a strong sense of community. Guests are greeted at the door, seated by a host, have their orders taken by a server, and are delivered a plate of nourishing food. Volunteers are essential to the success of each Saturday cafe. The Crescent City Cafe at Rayne is run by young adult volunteers, from hosts to servers to cooks. 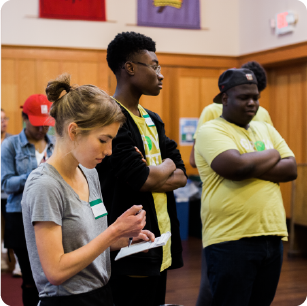 Each volunteer is a young adult eager to help people that are homeless, to give back, and to create change in their community. Volunteers are needed from 7am until 10:30am on the first and third Saturdays of each month and must be 18 years of age or older. Click the button to sign up. Not a young adult and/or can’t make it on Saturdays? Contact us about Friday prep nights or helping with laundry on the 3rd weekend. Do you have a certain skill? 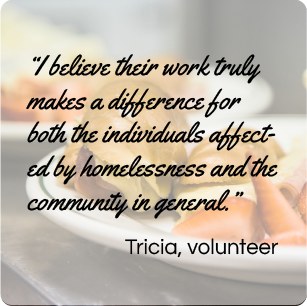 We need skilled volunteers with experience in fundraising, accounting, legal work, marketing, menu planning, and more. Contact us to share your talents with the Crescent City Cafe! 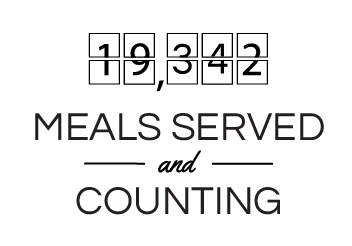 click here to share a meal and help us feed our community! recurring donations are the backbone of our growth and success. Click here and check the "make this a monthly donation" box on the following screen to join our team! help us by browsing through our amazon wishlist and donating specific items necessary to the running of our cafe. insert me plus three blurb here. We appreciate every donation! 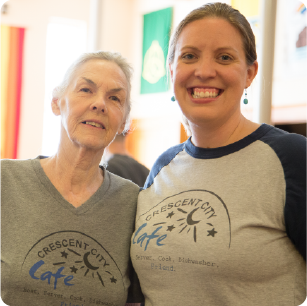 The Crescent City Cafe is an independent, grassroots non-profit organization supported by your tax-deductible gifts. E-mail us here if you would like to set up a recurring donation or have any questions regarding the donation process. *Crescent City Cafe is a registered nonprofit organization under Section 501(c)(3) of the Internal Revenue Code. Donations are tax deductible. *in order to set up monthly payments you must have a paypal account linked to a valid payment method. either click 'login' on the next page to log in to your paypal account or click 'pay using your credit or debit card' on the next screen to create a new one.